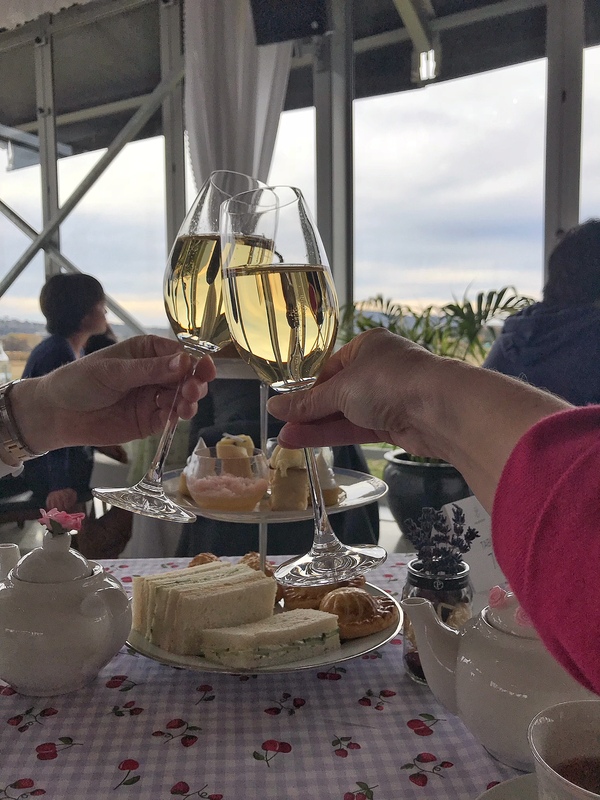 Paying tribute to the elegant whimsy of a traditional English afternoon tea party, but with a modern, playful twist matched with a stunning Canberra view and aesthetic is what you can expect attending the new High Tea sessions at Pialligo Estate. The picturesque rural setting of the property may only be 10 minutes from the city and a few blocks from the airport but it feels like an entirely different world. Upon driving in through the gates of Pialligo Estate and making your way through the beautiful entrance marked by the refined water fountain, all you can see is greenery, fruit trees and rolling hills in the distance. The stunning property has, since its opening, been a perfect backdrop for exquisite dining and memorable events. 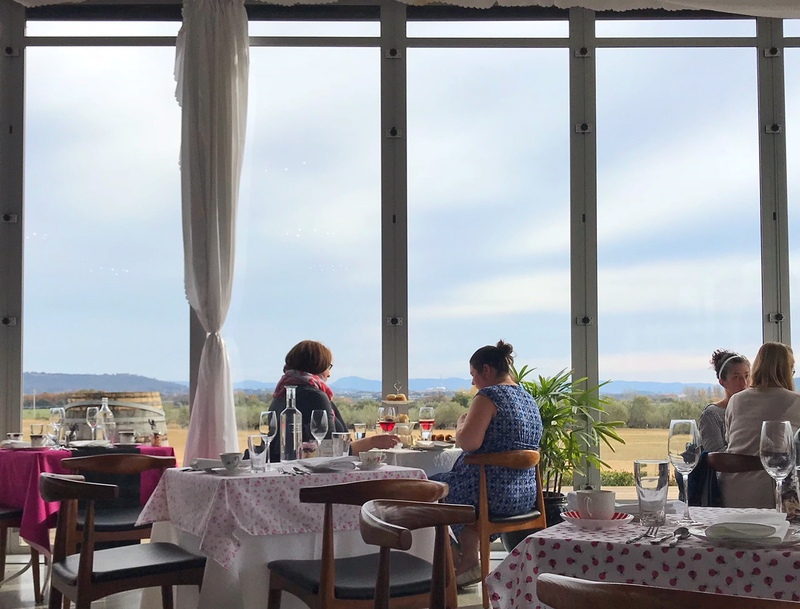 Overlooking Mt Majura, the vineyards, Paul Bangay designed orchards, market garden and olive groves with the private dining Garden Pavilions dotted throughout the beautiful grounds, it all makes for quite a view to accompany High Tea served in the Estate’s tranquil Glasshouse. An inspiring space filled with rich natural light, thanks to the dramatic floor to ceiling high glass walls, complete with rustic wooden furniture, long banquet tables and chandeliers, the Glasshouse is a true showstopper in itself. Walking in for the very first session of the High Tea this past weekend, I am immediately charmed by the ambience of the location plus the soft melodic tunes of local Canberra musician and acoustic singer Michael Misa discreetly playing in the corner. I am further delighted to see delicate pastel tablecloths with fruit motifs lining the tables, along with mismatched but carefully curated china – all set for a chic afternoon of good food and merrymaking. Upon being seated, we are offered a complimentary glass of sparkling wine (which we quickly accept) and are presented with the tea list. The menu features a handpicked selection from Canberra based Tea Garden Co. whose teas are sustainably sourced and deliciously blended. 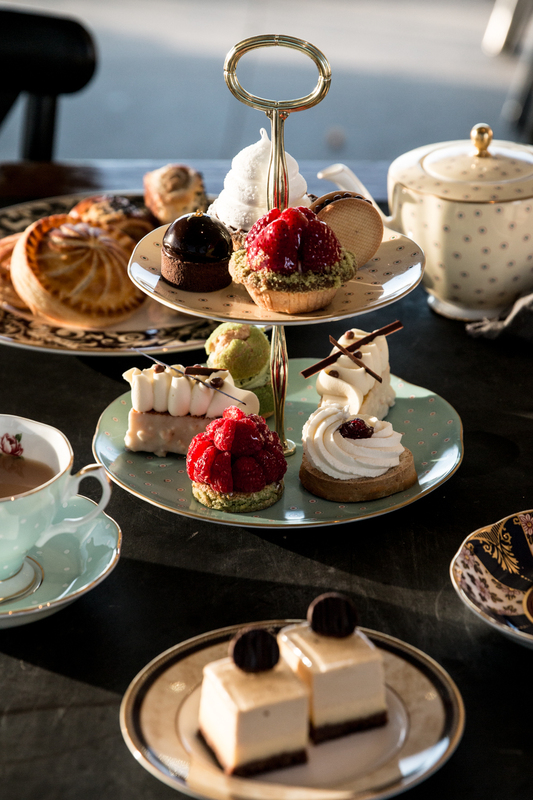 The range includes the classics of an earl grey down to a chai and some delectable fruity offerings. For the non-tea drinkers, there is also a choice of juices, coffee, and an additional wine list. 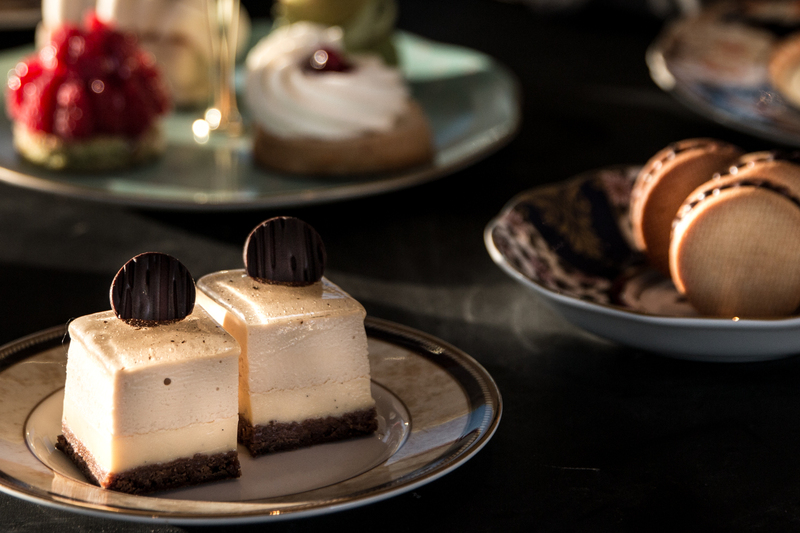 With our drinks in hand, it was not long before the three-tiered stand, featuring an assortment of meticulously crafted sweet and savoury bites, lands on our table. 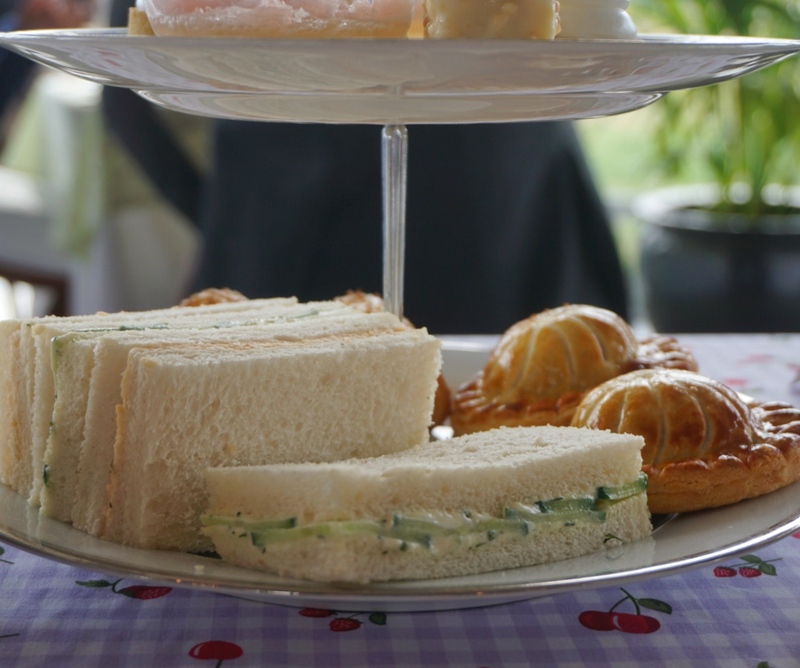 There is something splendid about the timeless ritual of delicate pastries, cakes, classic finger sandwiches and scones with jam presented in this manner. First up, we tuck into the bottom tier of the savoury selections, which included lamb and Pialligo Estate harissa sausage roll, garden cucumber finger sandwich along with my favourites of the day, shiitake mushroom and potato pithivier, housed in the tastiest puff pastry, plus the award-winning creamy smoked salmon and dill mayonnaise finger sandwich. The sweet offerings made up the top two tiers and was a rotating and tempting mixed selection made up of Dark Chocolate mousse and crispy hazelnut tartlet, Petit Choux puff with Uji matcha Chantilly, Orange almond cake with mascarpone Chantilly, Pistachio and raspberry tartlet, Dulcey mousse, ginger cremeux and sesame praline petit gateaux, Coconut and passionfruit petit gateaux and Mont Blanc White chocolate and Yuzu petit gateaux. My pick for the desserts we tried was the refreshing and pretty prosecco jelly and white peach granita verrine, along with the tangy lemon curd tartlet with meringue and I can never resist lemonade scones with raspberry jam and Chantilly. 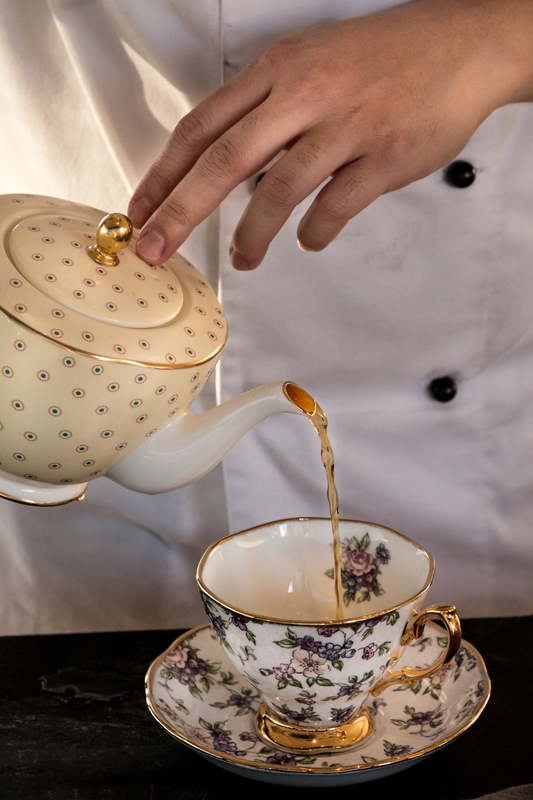 Whether you want to have a tête-à-tête or are celebrating in a group, the High Tea is a real winner to spark the mood of the immediate feeling of tranquil luxury and indulgence. Just remember, even though the portions are delicate and small, they are equally scrumptious and filling, so go hungry! 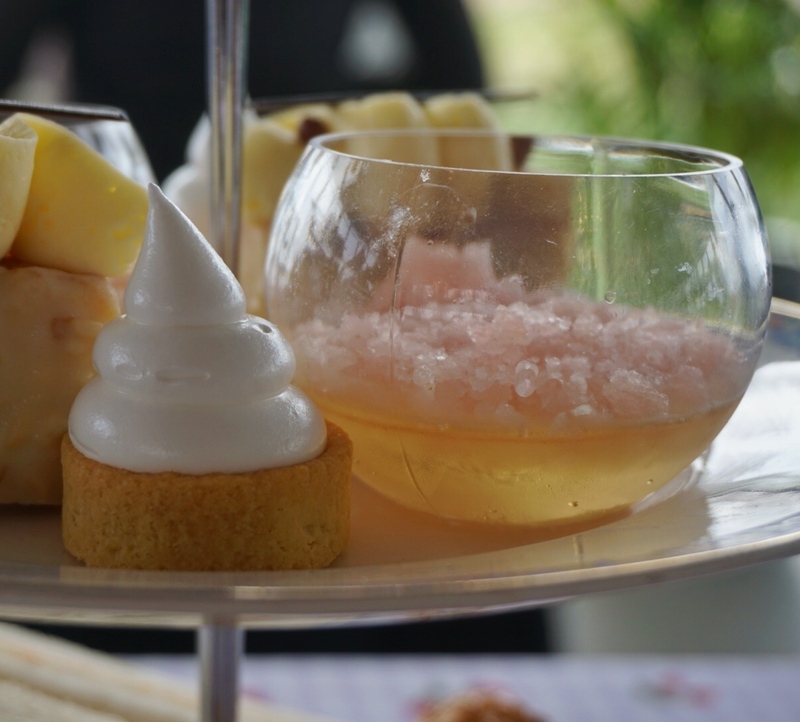 This entry was posted in Food & Drink and tagged High tea, Pialligo Estate. Bookmark the permalink.